This Acrylic round cupcake stand is designed for all occasions – parties, showers, weddings, tea parties! 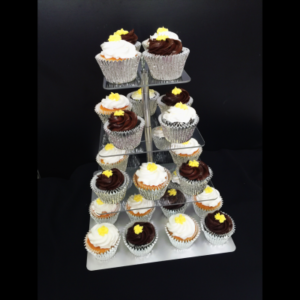 Use it for cupcakes, cookies, small cakes, even hors d’oeuvres! 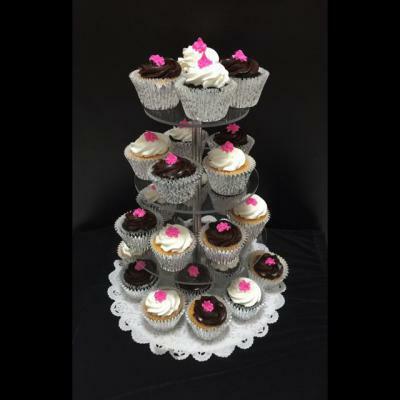 This 4 tier round cupcake stand is made of strong acrylic, using the traditional Cake Stackers™ anodized aluminum base plate and adjustable stainless steel center post. 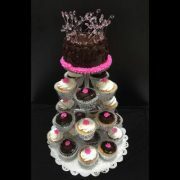 All parts are interchangeable so you can use as many or as little tiers as needed. Adjustable sizing allows for small or large presentations – 3 or 4.5 inches between each tier. The design possibilities will give you the professional creative edge to match the look and style needed for any occasion. 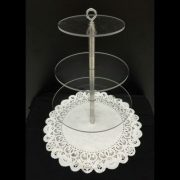 We also offer a similar square cupcake stand.